I’ve gotten this question a few times since I posted about my choosing to not having refined sugar in January. The truth is that there is absolutely nothing wrong with a little sugar. But, most people consume much more than a little sugar! The American Heart Association recommends women to keep added sugar intake to less than six teaspoons per day and men no more than 9 teaspoons per day. Guess how much most Americans consume? 22 teaspoons a day! That is over 3 times the recommended amount for women! Where is all that sugar coming from? Some of the biggest culprits are soft drinks and other sweetened beverages (coffee drinks, sweet tea, sport drinks and fruit drinks). Of course candy, cookies, cakes, pies and other desserts are high in sugar as well as sweetened yogurt and cereals. Why a limit on added sugars? Foods high in added sugars provide lots of calories with very little nutritional value. Often, intake of these foods displace intake of nutritious foods that would provide vitamins, minerals and other nutrients. In addition, consuming calories in excess of nutritional needs can lead to weight gain and the resulting health complications associated with obesity including cardiovascular disease, Type II diabetes and even some cancers. What about natural sugar in foods? Natural sugars are in all foods that contain carbohydrates – fruits, vegetables, grains and dairy. Consuming fruits, vegetables and whole grains has been shown to reduce the risk of some chronic diseases such as diabetes, heart disease and some types of cancers. How do I know how much added sugar is in a food? It gets tricky here. Currently the nutrition facts label on a food doesn’t distinguish between “natural” and “added” sugar. They are combined as “sugars” on the label under Total Carbohydrate. 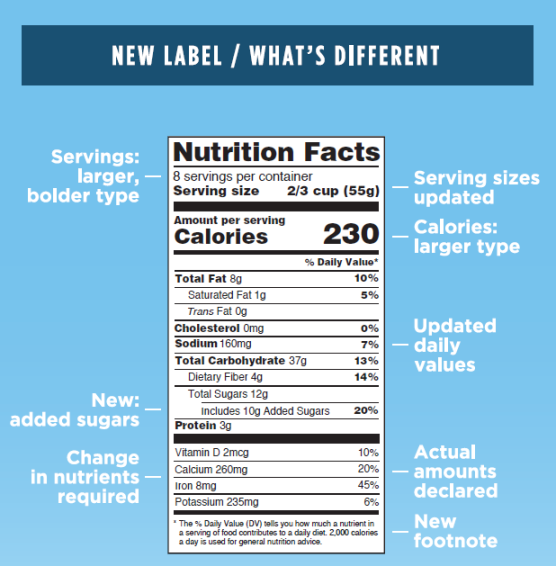 The new food label will help consumers determine if a food has "added" sugar. In my case, I’m simply trying to avoid added sugars (refined sugars) for the month of January to get off the sugar-high from the holidays! It isn’t necessary to completely avoid sugar, I just love a challenge! 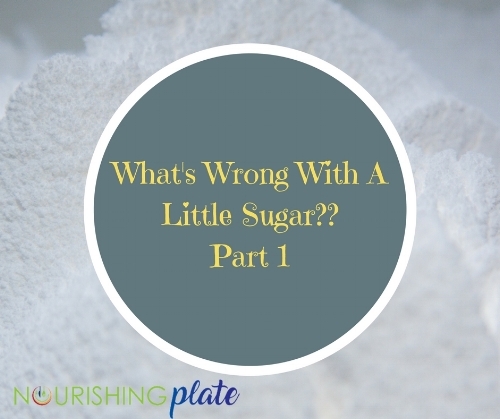 In Part 2 I’ll share some tips and tricks to decrease your added sugar intake. Oh, by the way, there is absolutely nothing wrong with the kissing type of sugar - in fact, more is encouraged! !